This September, marks the 11th anniversary of India winning the inaugural T20 World Cup, held in South Africa. Let us take a look back at one of the most exciting matches of the tournament – India vs England in the Super 8 stage. The World Cup comprised of 12 teams divided into four groups of 3 teams each. India was grouped with Pakistan & Scotland in Group D. A win over Pakistan & a No Result against Scotland, enabled India to top the Group and advance to the Super Eight. In the Super Eight stage, the eight teams were divided into two groups of four teams each. Other teams present in India’s group were New Zealand, South Africa & England. India had lost the first match against New Zealand. They needed to win the next match against England, to stay alive in the tournament. The venue of the match was Kingsmead, Durban. India, won the toss and elected to bat first. India started off with a 136-run opening partnership between Gautam Gambhir (58) & Virender Sehwag (68). Robin Uthappa was the next to fall, scoring 6, with India’s score being 155 for 3. There were another 3.2 overs to go. In came Yuvraj Singh and giving him company at the other end was the Indian Captain, MS Dhoni. India scored 12 runs off Andrew Flintoff in the 18th over, 10 of which came off the bat of Yuvraj Singh. 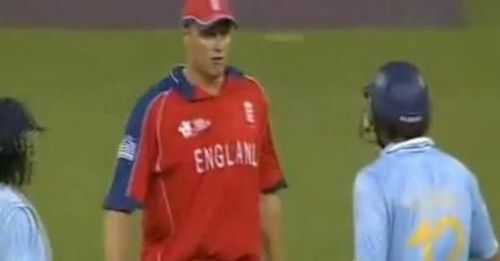 Flintoff, obviously upset, had a heated exchange with Yuvraj at the end of the over. If he thought that this would affect Yuvraj’s concentration, he could not have been more wrong. In some ways, he acted as a catalyst for what was to happen next. A heated exchange... and history was made! Yuvraj, was eventually out for 58 runs. Flintoff had managed to take his wicket. But it was too late, the damage had already been done. His 50 came off 12 balls, which at that time was the fastest 50 in T20’s. India ended the innings at 218/4 from 20 overs. In response, England could only manage 200/6 from their 20 overs. Irfan Pathan, 3/27 & RP Singh, 2/28 were the pick of the bowlers. The other wicket was taken by S.Sreesanth (//38). Yuvraj Singh, for his gem of a innings was deservedly adjudged the Man of the Match. India would defeat South Africa in the next match and go on to qualify for the Semi Finals. They defeated Australia in the Semi Finals and then in a nail biting finish defeated Pakistan in the finals, to be crowned the first T20 World Champions.